First, make the harissa honey mustard by whisking all ingredients together in a small bowl. Set aside. Set aside three shallow bowls in a row. Put the flour in one bowl, put the eggs in the next bowl and whisk them until uniform in color, and put the Manischewitz Potato Pancake Mix in the third one with the za’atar and whisk to combine. Heat a large sauté pan over medium-high heat and add ¼ inch layer of oil and heat. Set aside a plate with a paper towel on top. 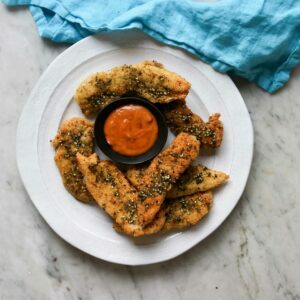 In batches, take the chicken tenders and dip first in the flour, and shake it off, then in the egg, and let the excess drip off, and then coat in the potato pancake mixture. Fry in the oil, about 2-3 minutes per side, until golden brown. Add more oil as needed.